I am interested in including the changes made in dolphin versions 4.0-4967 and 4.0-4971 into the 4.0-4722 version. My idea is simple: Since version 4.0-4724, I can't run any games under the OpenGL graphics, which render the best textures. In some of the versions I'm forced to use Direct3D instead, which does not look good, while other versions simply don't work. However, there's a fix regarding the Wii U Gamecube Adapter that I really want from versions 4.0-4967 and 4.0-4971 (C-stick is fixed). This should be very simple, if only I had the source from 4.0-4722, which is the latest version in which OpenGL works, but I haven't been able to find it anywhere. Does anybody know where I could find it? Actually the source code of any version between 4.0-4599 and 4.0-4722 should be fine too. Also, since I haven't built a dolphin version from source yet, could anybody give me basic instructions on how to start? Right now I'm installing Visual Studio 2013 for that matter. First of all, you should file a bug report if 4724 breaks OGL. https://code.google.com/p/dolphin-emu/issues/list But before doing so, have you made sure that's the bad revision? Anyway, Git uses file hashes rather than version numbers. But if you go to https://dolphin-emu.org/download/dev/9fb7091f369dfe7ff462807b55d896554c0f35bb/ , you can see that build 4722 (just before) is revision 9fb7091f369dfe7ff462807b55d896554c0f35bb. You can click the hash to go to https://github.com/dolphin-emu/dolphin/commit/9fb7091f369dfe7ff462807b55d896554c0f35bb , then click "Browse Files" -> https://github.com/dolphin-emu/dolphin/tree/9fb7091f369dfe7ff462807b55d896554c0f35bb , then "Download ZIP" -> https://github.com/dolphin-emu/dolphin/archive/9fb7091f369dfe7ff462807b55d896554c0f35bb.zip . However, I don't recommend this, because you can't "git cherry-pick" the C-stick fixes later on, defeating the purpose of downloading an old revision. Install Git and (I recommend) Git Extensions. Clone the repository at https://github.com/dolphin-emu/dolphin.git , and then checkout 9fb7091f369dfe7ff462807b55d896554c0f35bb to get the pre-4724 revision. Then cherry-pick the fixes you want (again, use the Dolphin historical download page to find the correct Git revisions) (or you could use https://github.com/dolphin-emu/dolphin/pulls?q=is%3Aclosed to identify closed PRs, but you cannot locate by build number). Thank you for the fast answer and explanation. I will follow the instructions and try to make the custom build tomorrow. For now, I'm just posting to be more precise about where the OpenGL error is introduced. I have been testing all of this with Project M 3.5/3.6, so my tests are on a brawl iso backup copy (I DO own a Brawl disc, mind you) and a virtual SD card containing Project M, which are loaded through Gecko. Also, I double checked on where the OpenGL issue was introduced. -From version 4.0-4724 to 4.0-4786 I simply can't open the game. The error is "DVDLowRead:_BufferOut==0", as soon as I press "Launch Game" in Gecko. I'm not actually interested in solving this, because it was later fixed, but this way I let you know that the issue is not related to OpenGL yet. -From version 4.0-4798 to 4.0-4811, there is also an error message when i press "Launch Game" in Gecko. The error this time is "No DVD found" (and yes, I checked that a path was selected for "default ISO"). Once again, this issue is not specifically related to OpenGL graphics. -Here is what I just noticed right now: from version 4.0-4861 to 4.0-4881, OpenGL works just fine. I didn't notice this before because it is such a small interval (thanks for telling me to double check). -The issue with OpenGL begins at version 4.0-4887 (which is the immediate version after 4.0-4881). The description of that version says "OGL: Work around Intel structures bug. ", which is quite ironic. -One last thing, save for forcing me to use Direct3D (bad textures) instead of OpenGL, the last development version (4.0-6970) works flawlessly. -Put the fixes from versions 4.0-4967 and 4.0-4971 (C-Stick fix for Wii U GCC Adapter) into version 4.0-4881, which is the latest version with no OpenGL issues. I am almost certain this should work, because the adapter shouldn't have any relation with graphic configuration (I guess). 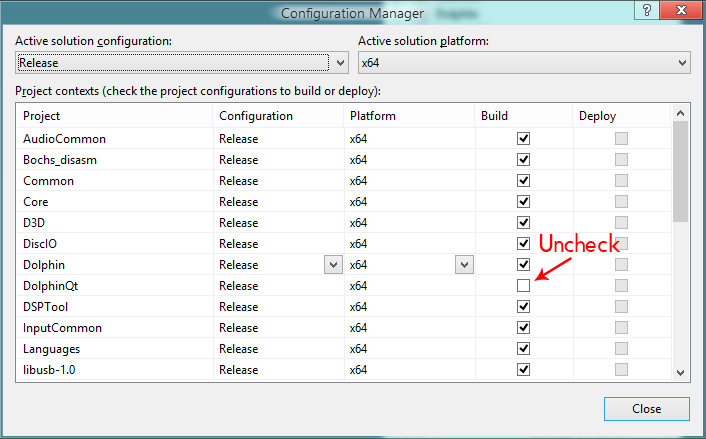 -Undo in 4.0-6970 (latest version) whatever change was done in 4.0-4887. This is not guaranteed to work, as many of the changes done in the versions in between these two could depend on what was done in 4.0-4887. However, if it worked, it should be the better option. I will try both following the links you just gave me. Did you try updating your drivers? If it's fixed by driver update, either you uncovered an intermittent Dolphin issue only exposed by certain drivers, or your old driver is causing the problem. "Undo in 4.0-6970 (latest version) whatever change was done in 4.0-4887." Just use Git Extensions and revert, it will tell you if it can't do it, and if it can't compile afterwards, it's broken too. Hmm since you have 2 GPUS, are you sure Dolphin is using the nvidia one? I think you need to create a profile for Dolphin and set it to high performance mode or something. Also, could this be a shader cache issue? Like the 1st try with a version works, and the 2nd crashes? The shader cache is in C:\Users\*yourusername*\Documents\Dolphin Emulator\ShaderCache. You can just delete all files in there for each test. (07-08-2015, 03:50 AM)mimimi Wrote: Hmm since you have 2 GPUS, are you sure Dolphin is using the nvidia one? I think you need to create a profile for Dolphin and set it to high performance mode or something. Yes, indeed, I created a profile for Dolphin and set it to high performance. The crash only occurs when I attempt to use OpenGL on the newer versions (4.0-4887 and newer); Direct3D works fine (save for the bad textures). Why should this be a thing? My PC has sufficient ram and graphic capabilities for running Wii games on OpenGL, as seen from previous dolphin versions. (07-07-2015, 05:37 PM)jimbo1qaz Wrote: Did you try updating your drivers? Yes, I have one NVidia update, and I'm downloading it right now. I'm not sure it'll fix the issue, though. I am more inmersed right now in trying to make my build work. I just finished making the source, but I have one error while building it. It's "QTDIR not set or non-existent (pull the submodule?)". At first I thought it was related to my build, but I get the same error while trying to build 4.04881 (without modifying it). Do I need to update git, or something? I have git version 1.9.5.msysgit.0 (that's what the command line says when I write git --version into it). I'm building from VisualStudio 2013. You can uncheck it if you don't want to build it. To be frank, I am not quite sure where my git repository is supposed to be (I am getting the error "not a git repository(or any of the parents directory)" when I type "git submodule foreach git pull" or "git pull --recurse-submodules" while inside the Source directory of dolphin version 4.0-4881 in cmd). Shouldn't I be able to download 4.0-4881 and build it right away with Visual Studio 2013? I'm sorry, I'm quite lost here.